Some research suggests that being underweight may slightly increase your risk of developing some cancers. It is recommenced that you try and have a healthy BMI through eating a balanced diet and staying active. Provided you eat a balanced diet and stay active, there is nothing more you can do to prevent cancer with regard to this lifestyle risk factor. Even being a little overweight increases your risk of developing cancer. In our study almost 1/3 of the people surveyed did not know this. Of the 67% of people who were overweight or obese almost all of them did not know that their current weight was putting them at risk of developing cancer. According to your calculated BMI you have an increased risk of developing cancer. Now that you know this you can choose to do something about your weight. 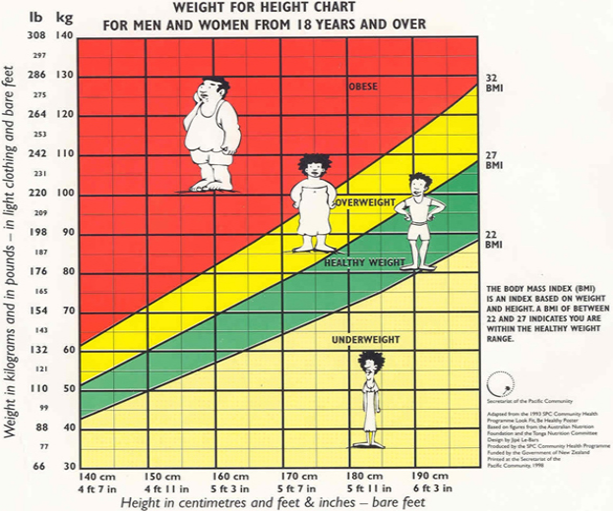 For the vast majority of people weight can be managed through diet and exercise. We can offer help and advice but you need to do this for yourself. If you take the appropriate steps now to reduce your weight, not only will you reduce your risk of developing cancer but you will also significantly improve your overall health and longevity. As you proceed through this app take care to review the diet and exercise sections to get advice. Where did you fall on the graph?